People say that your father is the first man in a girl's life...and they are right. 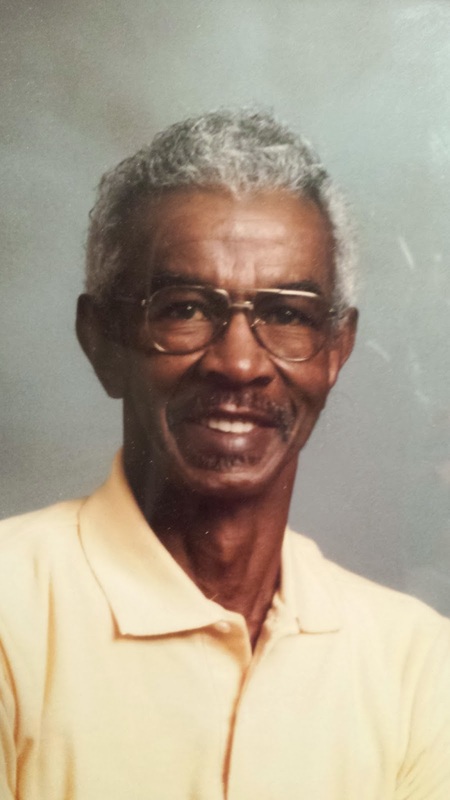 Emmitt Harris was the first man in my life, and to be honest, the most influential one. My daddy left me on Thursday, January 30th, not two hours after I kissed his forehead, patted his hand, and told him I would see him the next day. See, my dad has been battling Alzheimer's Disease and dementia for the last year or so. He fell down Thursday morning and, as we found out later, broke his hip. We took him to the hospital, they did X-rays, and the doctors told us that the only way it would heal at all was if we agreed to surgery. The sticking point was, Dad was in hospice and we had decided we were not going to do any surgeries. Long story short, we were going to forgo surgery, hospice was going to oversee pain management, and Dad was going to spend his days at home in bed or in a wheelchair (if he could handle that, because he would not be able to walk on a broken hip). Looking back, deep down, I don't think he wanted all that. But that is not what this post is about. This is about who my dad was. He was a quiet, simple yet smart man. He kept things to himself, almost to the point of being secretive. It will be interesting to see what we find when we start going through all of his things. But some things my father was for sure - he was loyal, he was loving, and he was proud. Even if he didn't tell you directly. Once I told my dad that the tires on my car were bald and I didn't know how I was going to find the money to pay for them. I was newly married, just started a new job, and really strapped for cash. I hung up the phone from talking to him and after about an hour, he called me back and asked what size tires my car had. He also asked if there was a particular tire store near my apartment. He hung up again and after about another half-hour, called back again and said I could get new tires for my car at a tire store near my home and he would pay for them. He used to tell me after that I still owed him for those tires, but he would have this tiny smile on his face...I knew he did it to help his baby girl. My dad taught me football...he loved his Broncos and his Oklahoma Sooners (it irked him that my brother is a Texas Longhorns fan!) He showed me the difference between an eye formation and the shotgun formation. He told me what a post pattern was and "if a ball hits a receiver in the hands, he damn well better catch it!" He let me know that the Oakland Raiders were the worst, most hated team in the world. We got in trouble my first weekend away from home when I went to college because we spent an entire Bronco game on the phone, long distance. Mom was not pleased. He taught me how to install ceiling fans and a ceramic tile backsplash for my kitchen. Dad finished an entire basement, from the electricity to the drywall, wet bar, and flooring - with no formal training in any of those things. A man of many talents. He showed me how to make the perfect charcoal briquette pyramid to barbecue with (which translates into making the perfect firewood pyramid for camping). Dad liked his cars...he was an admitted Chevrolet man. I remember he had a '76 Impala, metallic midnight blue with a white top. When he drove downtown, he would go down 18th Avenue, where the side streets come in and make a big hump - which makes the ride in a car like the Impala more like a roller coaster. I would tell him, "Go faster, Daddy!" And he would, because I asked, and I squealed like crazy. Maybe he liked that sound. One time, he came home with a Datsun 280Z - a tiny little sports car. Mom was not pleased. But my brother learned to drive a manual transmission on that car, when he was 3. I think that's when John's love of cars actually started. Until the end, I only saw my dad cry 3 times - when I graduated from high school, when I got married, and when he saw his best friend in a casket. Dad was not one to show a lot of emotion...although you always knew if he was mad - that brow would furrow, his jaw would get tight, and you knew you'd better vacate the area. I see that same expression in my daughter (probably because it's mine, too.) Don't get me wrong, Dad had a sense of humor too - he'd get that little smile, that "heh-heh-heh" laugh...but it was rare to see a true belly-laugh. That wasn't his way. See, Dad was an Aries, the sign of the Ram. His birthstone was the diamond. He very much embodied both of those things - he was not big in stature, but he still had great heart, stubborn, and could hurt you deep if you pissed him off and got in the way of those horns. Dad also had many facets, like a diamond, with flaws that could be seen by the naked eye and ones that were small and secret. But he was still clear and handsome, and the hardest substance you'll ever run into. I'm glad I married a man who is a lot like Dad. I'm glad my children had a very close relationship with him and were old enough to remember him before he left us. I'm glad I got 45 years with Dad, because some of my friends lost parents way too soon. Daddy, you have fun up there in Heaven. I hope it was Ed who met you at the end of the light, and maybe your mom. Pat all my puppies and Bender on the head for me. I wish there was a phone so we could watch our Broncos in the Super Bowl today, but that would be one hell of a long distance bill, and Mom would not be pleased. The news saddens my soul. Your family is in my prayers. Sending much love. Your dad was a wonderful man. He had the best daughter ever. Beautiful words, Nich. Makes me wish I'd known him better. Reading this, now I do. I burst into tears and laughed out loud all at once at the last line. Love you, girl. I'm glad to have met him, and now I understand why I didn't know him a little better. Thanks for posting this -- he played a large part in determining who you are, and for that, I am grateful.